Bríd Smith TD – as Gaelige, i rith Seachtain na nGaelige. Fáilte mór for the naíonra! People Before Profit TD, Brid Smith, warmly welcomes the work started today on the first Irish Language creche and cultural centre in Ballyfermot. The Naionra and Irish Culture Centre will be developed in the former Convent Lawns Community Centre. Children have a right to their own language. 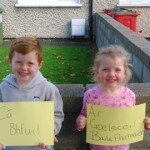 This is why Brid supports the campaign of parents in Ballyfermot for pre-school facilities delivered as Gaeilge in Ballyfernott.